Explanation: Mars has its ups and downs. Visible on the above interactive topographic map of the surface of Mars are giant volcanoes, deep valleys, impact craters, and terrain considered unusual and even mysterious. Particularly notable are the volcanoes of the Tharsis province, visible on the left in (false-color) red and white, which are taller than any mountains on Earth. Just to the left of center is Valles Marineris, a canyon much longer and deeper than Earth's Grand Canyon. On the right in blue is the Hellas Planitia, a basin over 2000 kilometers wide that was likely created by a collision with an asteroid. Mars has many smooth lowlands in the north, and many rough highlands in the south. This map was created by the Mars Orbital Laser Altimeter (MOLA) on board the robot Mars Global Surveyor currently orbiting Mars. 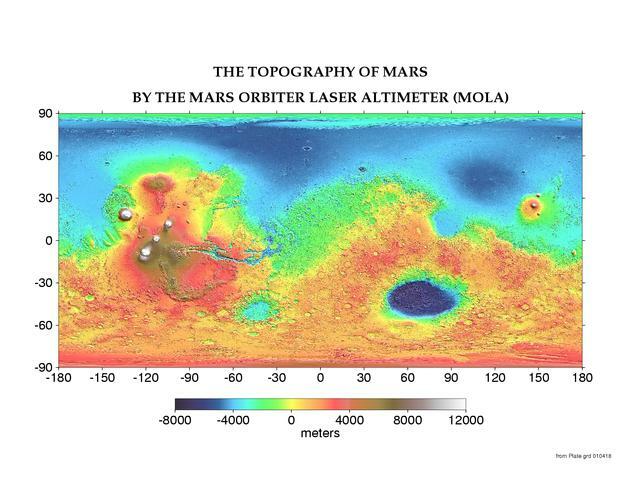 MOLA measures heights on Mars by precisely determining the time it takes for a low power laser beam to bounce off the surface. Zoom in by clicking anywhere on the above map.